This time we continue with our exploration of places that we missed over the course of these reports. Again, some of these are newly opened and some have been around for a long, long time. We begin at a place that is somewhat of a Nashville institution. Rippy's is located almost directly across Broadway from Jack's Bar-B-Que and directly across 5th Avenue from Bridgestone Arena. Due to its location, this is a very popular hangout before and after events at the arena. Consequently, because I can't stand standing room only crowds, I rarely find myself at Rippy's. 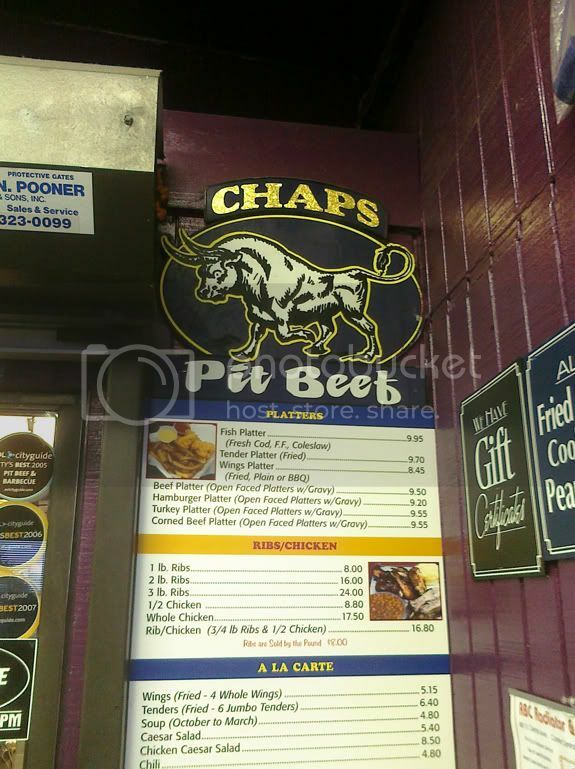 The last time I ate there was before the 2005 NCAA Tournament games, and I don't remember the barbecue being very good. In the interest of fairness and thoroughness, though, it's time for a re-visit. As it turns out, the barbecue was better than I remembered. I ordered a sampler platter that included, among other things, ribs and pulled pork. The ribs were baby backs that were cooked just a bit shy of perfect doneness, but weren't too tough. They had a nice smoke flavor, and a slightly sweet crust. Not a bad rib at all. The pulled pork was also pretty solid. It wasn't quite as smokey as the ribs, but was very juicy, having had some type of vinegar-based sauce applied to it. It was very uniquely seasoned, with almost a chili-like flavor (I definitely tasted cumin). Overall, Rippy's is not as good as Jack's right across the street, but it's not bad. I was cruising around out in Old Hickory, looking for Hickory Brothers BBQ (and never did find it...anyone know if this place still exists? ), when I happened upon a gentleman tending a large offset cooker in a Piggly Wiggly parking lot. As it turns out, this is Gourmet Ribs. They set up at the corner of Robinson Road and Merritt Street Wednesday through Saturday. They serve all manner of smoked meats, as well as fried fish. Let's start with the ribs. These are untrimmed spares that are cooked until they nearly falling apart. The ribs are seasoned very simply, with what tastes like nothing more than salt and pepper. The simple seasoning, combined with plenty of great smoke flavor, makes for a tasty pork treat. Sometimes I forget how great ribs can be without an overload of rubs and sauces. These are very good. 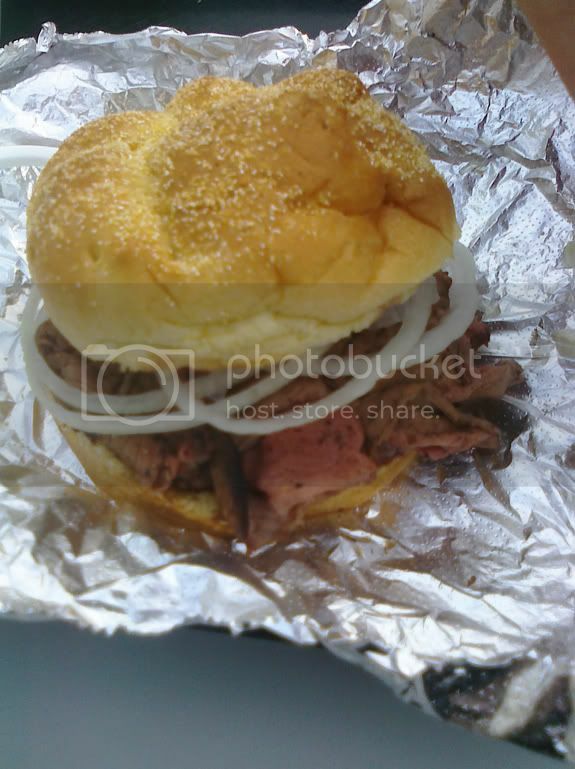 The pork sandwich was also a winner. The pork was nicely seasoned and nicely smokey, with a good amount of bark pieces on the sandwich. My only complaint was that the pork was slightly dry, but the sweet and tangy sauce helped with that. I have heard scattered mentions of House of Hickory Bar-B-Q over the years, but never made my way there until recently. They're only open Monday through Friday, and only until 5:00. When I stepped inside, it had the feel of a place that had been there for a long time, so I asked. Sure enough, the man said, House of Hickory has been open for over 40 years! How does a place that has been around so long manage to stay so far under the radar? Well, maybe their product just isn't that great. I was underwhelmed by both the pork sandwich and the ribs that I ordered. The pork was mushy and bland. The ribs were a little better, but still not great. Maybe I caught them on a bad day, but the meat just did not taste FRESH. There is a new player in the East Nashville barbecue scene since we did our report on that part of town a year and a half ago. Drifters BBQ opened up in the spot in the Five Points area formerly occupied by the Alleycat Lounge. The restaurant is owned by Matt Charette, who is developing a mini-empire of restaurants in East Nashville (Beyond the Edge, Batter'd & Fried, Watanabe). 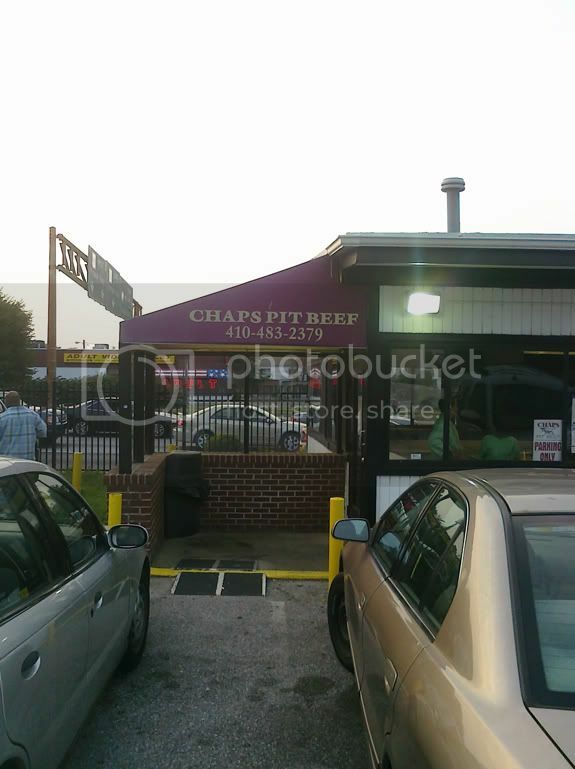 You will notice in the picture above that there is a barrel cooker out in front of the restaurant. This is merely a prop. You might remember that last year we featured an article on Drifters and how they had chosen to use a roaster to cook their barbecue. Let's see how that barbecue turned out. The pulled pork on the left was nicely seasoned, but (as to be expected) had no smoke flavor. It was also relatively dry. The ribs on the right were baby backs cooked to fall-off-the-bone tenderness. They were served sans sauce, but had a very interesting savory-sweet rub that was more complex than most. Again, no smoke flavor, but the rub was a pleasant surprise. Drifters was not short on sauces, and with curious geographic designations. I'll allow the New Mexico sauce, since I am really not familiar with that state's barbecue traditions. You'd think the mustard-based sauce would named after South Carolina, but it gets Georgia instead. Tennessee was about right (ketchup-based, but not too thick and with plenty of vinegar), but Texas? I didn't think they believed in using barbecue sauce in Texas? Anyway, this Texas sauce was smokey and sweet (more like a Kansas City-style sauce). Our last stop is a place that in its short life has already elicited some strong opinions (many not so favorable). The Blind Pig no. 55 went into the space formerly occupied by longtime 12 South favorite Mirror. The restaurant is the brainchild of the Hospitality Development Group, which also owns and operates Watermark and Miro District. "Upscale" barbecue restaurants are kind of like hanging curveballs for barbecue purists, and quite a few have teed off already. I went in with meager expectations and an open mind. Once again, there are a variety of barbecue sauces from which to choose. It's interesting to me that there is not a "sweet" option. I'm not necessarily complaining, but I bet some people will. Not my best photography, y'all, and I'm sorry for that, but bear with me. I told them I wanted some ribs and some pulled pork, and this is what they came up with - a baby back rib platter with an order of pulled pork added on. And it came out to about $16.00 after tax, which is a little steep, but not unreasonable for this amount of food. And while we're addressing the preconceived notions, yes, the sides were awesome. But we're here for the barbecue, aren't we? The ribs were baby backs, and they were just about perfectly cooked - nice bark on the outside and tender and juicy on the inside, pulling away from the bone with a slight tug. But the flavor was...intense. These are some of the smokiest ribs that I have tasted in these reports. The intensity didn't end with the smoke, either. These ribs, which came without sauce, were coated in a rub that was strong and complex, with lots of spices and seasonings. Overall, a unique and tasty rib. The pork was average. It didn't have the overwhelming smokiness of the ribs, but then again it didn't have much flavor at all. It was relatively dry, but was opened up nicely by one of the vinegar-based sauces on the table. Sometimes, in this world of so many sweet barbecue sauces, we forget was a great complement vinegar is for pork. Anyway, overall, this place exceeded my (admittedly low) expectations. 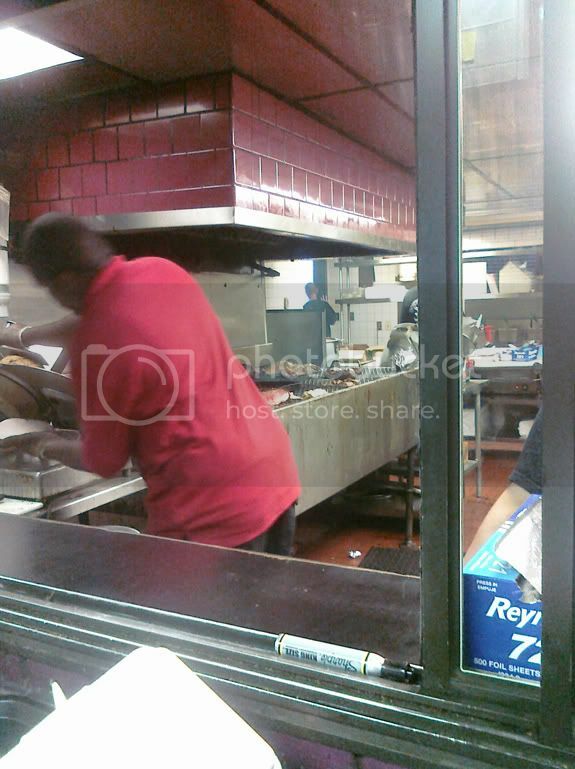 Service was prompt and efficient, and I got my food quickly. The barbecue was average or slightly better, and the side items were very good. The price tag was not outrageous. Here's hoping they can continue to improve. Well, friends, this concludes our nearly two year exloration of Middle Tennessee's barbecue joints. It's been an adventure visiting some new places and some old favorites. Some have asked me if it's made me sick of barbecue. Not of barbecue, I answer, but of mediocre barbecue. And there is a lot of mediocre barbecue in this city and in this world, Dear Reader. The good stuff is out there, but you have to look hard to find it. And it's getting harder and harder to find. So when you find one of the great places, let them know you appreciate them, and support them! Don't think that this will be last time you see me reviewing a barbecue restaurant! I will certainly be keeping up with the new openings, and continuing to explore in Middle Tennessee and beyond. So if you know of a good place, let me know! Last night we made our annual trip to the Wilson County Fair. If you didn't already know, Ulika is a huge fan of the fair, and Wilson Co's fair is the best in the state. Naturally, part of the fair experience is checking out the fair food. 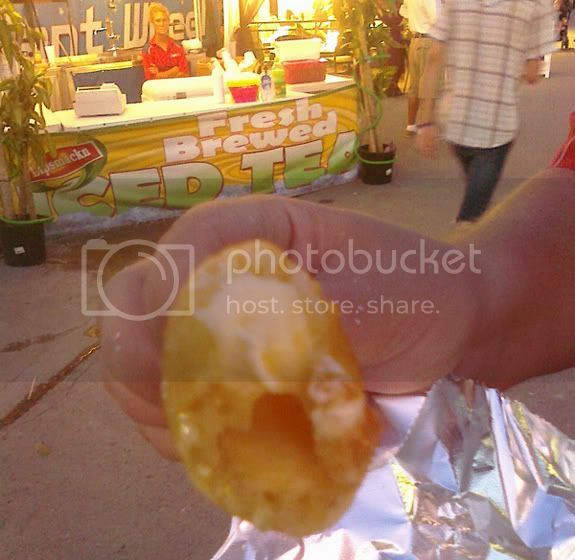 This year, one thing that has been gaining a good amount of publicity is the fried butter. Out of curiosity, we had to try these jewels. 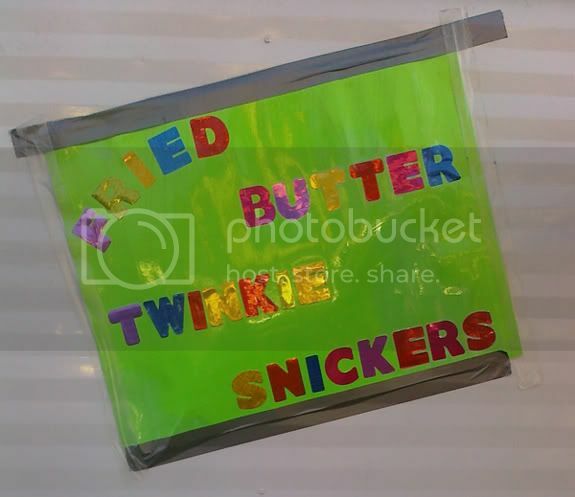 It was a little difficult to find the fried butter, but then we stumbled upon the sign. 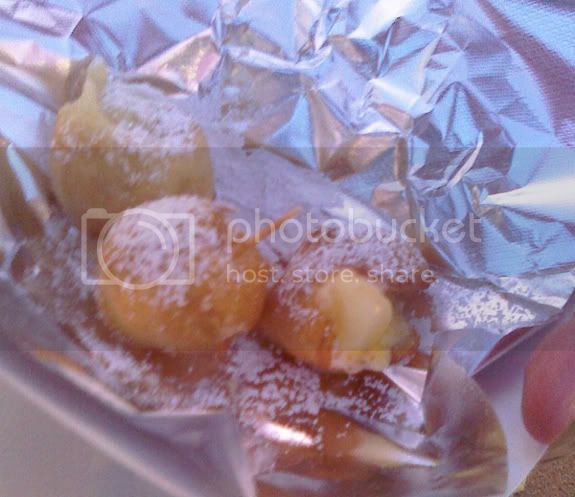 The frozen pats of butter were deep fried to perfection with the ever-so-common fair batter. The whole thing receives a little sprinkle of powdered sugar and it's really that simple. BP compared it to a overly buttered dinner roll, and I agree. It was not all that bad, and the novelty factor is really high. 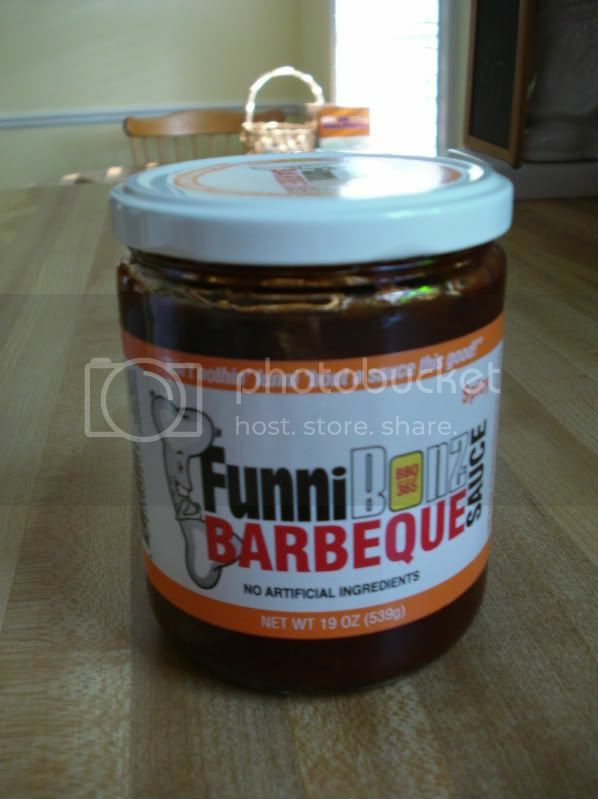 Not to be confused with TBonz dog treats, FunniBonz is a line of barbecue-related products. At this time, they only have sauces (Original, Spicy, Fiery Chipotle, and Tangy Mustard), but they eventually plan offer marinades and rubs as well. The story goes that Jim Barbour, founder of FunniBonz, could not find a barbecue sauce to his liking - all were too vinegary. 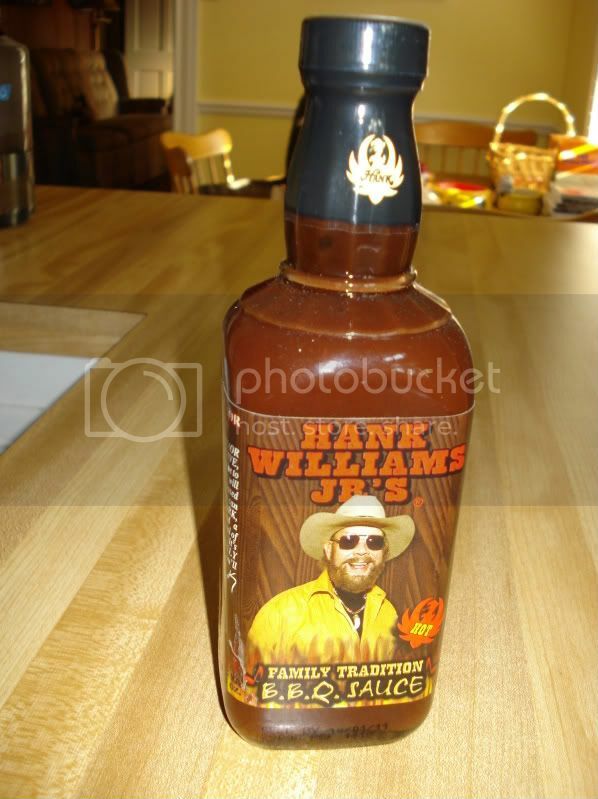 So, being between jobs, he decided to create his own barbecue sauce, and FunniBonz was born. The sauce certainly stands out on the grocery shelf due to its being in a jar, rather than the usual bottle, and due to its unique name and label. The sauce promotes a philosophy called "BBQ 365," which is that barbecue sauce can be used year-round in many different kinds of dishes, not just summer barbecue season. And they have a significant web presence (Facebook, Twitter, Blogspot, LinkedIn). The first thing you notice when you remove the lid is that this sauce is thick! It's not much thinner than honey, in fact. It has a deep brownish-red color, and it has lots of bits of spices in it. Tasting it, you can see that Barbour was definitely going for a sweet sauce - this one is sweet! But while the sweetness might be overwhelming in the original flavor, this spicy version has enough heat to cut the sweetness. It's got a nice burn to it, but it's not overwhelmingly spicy. There are also plenty of other complementary flavors - notes of mustard, garlic, onion, tamarind, cinnamon, and cumin. Overall, it's a very flavorful sauce, and one that I enjoyed. Alamo, Charleston, Moscow, Oakland, Paris, Philadelphia, and Savannah are all towns across the great State of Tennessee, but have you ever been to Mexico Tennessee? That is where we are reporting from today. This little city just off Nolenseville Rd. 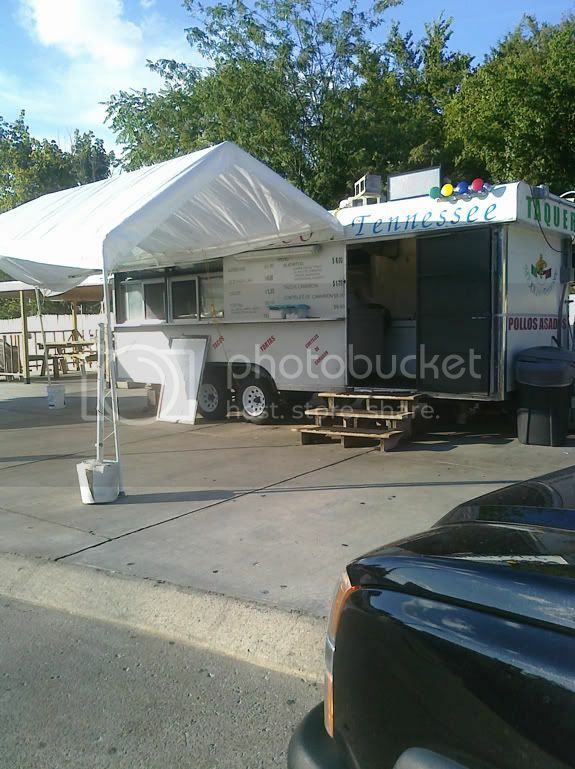 is located right behind the drive-thru Quick Cash and it's only resident is a little taqueria. When we visited Mexico, TN we tried dose chorizo, uno chicharrones, and uno asada taco. 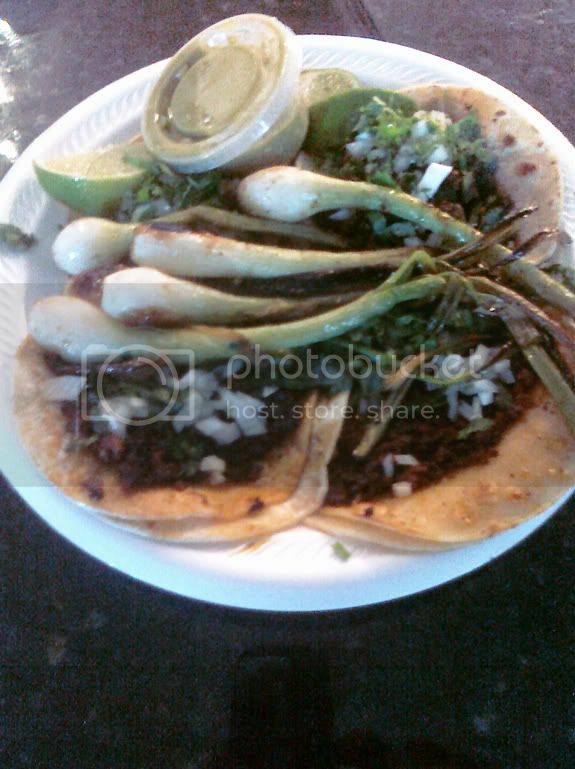 These tacos came garnished with some grilled whole green onions, and the traditional cilantro and diced white onion. There was also a side of green creamy guacamole hot sauce and a lime. The grilled whole onions came as a huge surprise. Even those fancy taco places don't garnish this well. The tacos here were $1.50. Well worth the price when you consider the amount of meat and the extra special touch of the grilled onions. Overall I would have to say that this is one of the best taquerias that I have been to. I keep mentioning the grilled onions, because they really helped set this taqueria apart from some of the others. This taqueria also offers some shaded outdoor seating, and I even spotted a cheeseburger on the menu (for your non-taco loving friends). 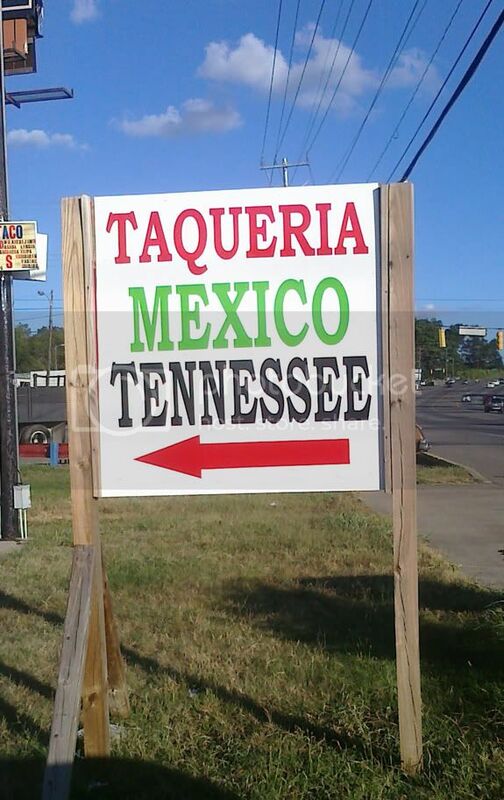 So if you are ever in the neighborhood, you should consider visiting the little town of Mexico Tennessee.